to stop the destructive habit of binge drinking – for good! Stop Binge Drinking with this powerful hypnosis mp3!! 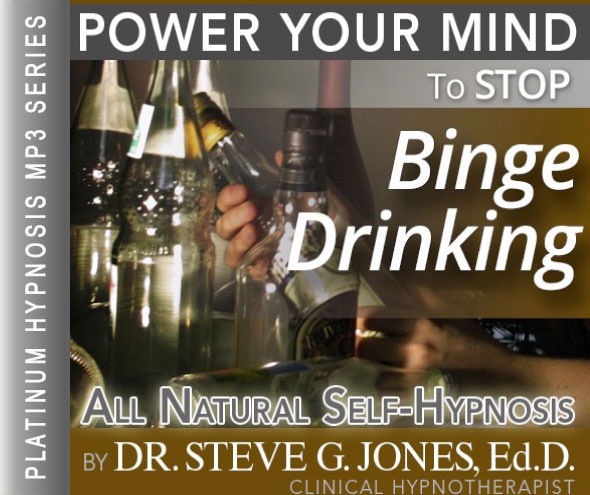 Start your detox and recovery from harmful binge drinking with this self-hypnosis mp3 by Steve G. Jones! Whether or not you want to admit it, binge drinking is a form of alcoholism that is as dangerous to your physical and mental health and your relationships as drinking too much on a daily basis. If you can’t seem to break the cycle of binge drinking then this Stop Binge Drinking Hypnosis MP3 can help. In order to change the habitual part, and even the physical addiction to drinking, Stop Binge Drinking Hypnosis MP3 reaches into the part of the mind where the need to do something habitually is stored. You are put into a relaxed state through soothing dialog. Once relaxed, a spoken message reinforces the changes you want to make. This is done for 21 consecutive nights to cement the behavioral changes. Steve G. Jones is a clinical hypnotherapist who has developed a self-hypnosis program specifically targeted toward binge drinkers. “Stop Binge Drinking” is available in an MP3 download or in mp3 format. finally overcome being a binge drinker!!! What is the difference between drinking and being a binge drinker? Simply put, binge drinking is drinking to get drunk – a self-destructive and unrestrained drinking bout. Binge drinking is now a problem in many western countries, even though individual countries have different tolerance levels of binge drinkers. In the United States, binge drinking is the consuming of four or more drinks by a woman, or five or more drinks by a man on an occasion. In the United Kingdom, binge drinking is commonly defined as consuming 11 or more drinks on an occasion. This is more than double what is considered binge drinking in the USA – yet binge drinking in the United Kingdom is now so serious; the British Government is about to bring in measures to tackle the problem. Binge drinking is irresponsible; heavy drinking that often comes under the disguise of fun and games. Binge drinking is terribly dangerous to the drinker and to the people around them.This powerful Binge drinking hypnosis mp3 could be the solution for you. Alcohol poisoning – a severe and potentially fatal physical reaction to an alcohol overdose. Do you have a binge-drinking problem? Do you recognise either of these harmful and destructive behaviours in your own life? Are you drinking more heavily and more often? Is your drinking affecting your work or upsetting your partner or family? Luckily, there’s an effective solution to binge drinking – Binge drinking Hypnotherapy , using my binge drinking mp3. We all tend to be miss-programmed by negative input in some way and neuro-linguistic programming reprograms the mind for a positive outcome. This Hypnotherapy MP3 puts the mind in a state that will accept the re-programming more readily,This binge drinking hypnotherapy is a very effective solution. By using my hypnotherapy MP3, you can re-program your binge drinking behavior in a few weeks. You can stop binge drinking by re-programming your brain – you can do-it-yourself by using this self-help Stop Binge Drinking Hypnosis MP3 download. Either way the result is the same – to change your usual self-destructive “drink to get drunk” activities to a pleasant “have a few drinks and have a good time”. It’s a matter of self-control, and there are neuro-linguistic and hypnotherapy techniques that create a sequence of thinking that get the brain to move from the thought of drinking to excess to the thought of just having a moderate amount of drinks and enjoying yourself. But you can get all the benefits for this low price. Simply listen to the Stop Binge Drinking Hypnosis MP3 audio every night as you go to bed for three weeks and feel the changes happening in your life. You will feel more empowered, more in touch with your true self, and you will truly know that your goals are within your reach. We all like to have a good time. We all like to relax after a long week at work or a difficult week at school. I often have people emailing or calling me with the concern that they drink a little too much. I always ask whether they think that alcoholism could be a problem and I also ask if it runs in their family. I am not trained to work with alcoholics and I refer them to their local chapter of Alcoholics Anonymous. When clients contact me with a concern about alcohol, often times they say that they don’t drink much during the week, but they tend to go overboard on the weekends, this is called binge drinking. They wish to have a little more control over how much they imbibe. It’s easy to go a little overboard when you are in a social situation and people are drinking all around you. It’s also easy to have too many drinks when you are alone and you have nothing better to do. I encourage people to drink in moderation. I also encourage clients to set limits. Many choose to cut themselves off after one or two drinks. It’s a way to learn how to control how much you drink. They key is moderation and control. After getting into the habit of disciplining yourself, it becomes second nature and drinking alcohol becomes easier to control. And as you relax more and more deeply, you realize just how powerful you are. I would like you now to imagine yourself in a situation where alcohol is present. And notice that if you have any, you have a very small amount, a very, very small amount. Whether you are alone or with friends, a very small amount is enough for you. And perhaps you will choose to avoid alcohol completely, that is your own powerful choice because you have the power to control your actions. And you will find that day by day you are able to deal with stress and tension easily. You see the situations in your life as challenges, challenges which you will easily overcome. And so when stress arises in your life, you deal with it immediately, efficiently, and maturely. And then you continue to relax. And you now choose other, more productive activities rather than drinking. Think now about all the activities you enjoy doing, that’s right. There are so many positive things in life which bring you pleasure. And so rather than drinking you find that you are interested in many of those activities. And if you find yourself in a situation where you are drinking, you realize that you will have tremendous self control and you will only drink a very small amount of alcohol and if there is any matter on your mind, you will deal with that matter easily and efficiently, you will deal with that emotion in a very productive way. Drinking in moderation is a rule you should and can live by. Binge drinking has a negative impact on your health in the short term and in the long term. Drinking to the point of intoxication can impair your judgement and your motor skills. Binge drinking can lead to alcohol poisoning and alcoholism. In the long-term, frequent binge drinking can have a major negative impact on your lifestyle. The good news is that hypnosis can help you gain control over your drinking. The Stop Binge Drinking Hypnosis MP3 recording targets your subconscious mind to help put you back in control. After 21 nights of listening to this hypnosis session, you will no longer feel the need or want to binge drink. You will be in control over your drinking habits. The powerful Stop Binge Drinking Hypnosis MP3 program will help you see the importance in stopping binge drinking. You can improve your life and your health by getting rid of your bad habit of drinking too much. We suggest you listen to this hypnosis recording for 21 nights in a row before going to bed. Day by day, your subconscious mind will be reprogrammed to no longer want to binge drink! You can regain control with hypnosis!